Our Annual GroundHog celebration is just days away. I definitely must be on task this week. First on the agenda is grocery trip…. Supplies for Friday’s dinner and the King Cake are a necessity. 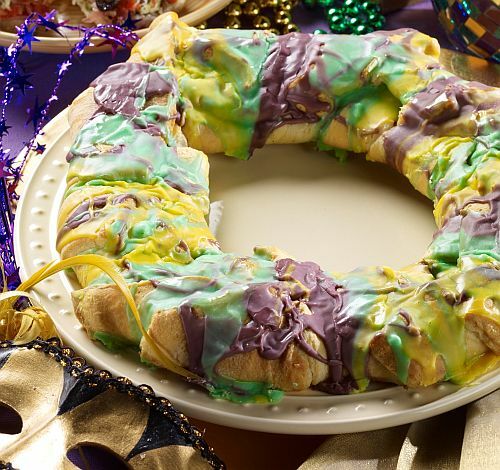 What’s a King Cake? It has everything to do with Mardi Gras and Fat Tuesday. It’s a traditional sweet pastry dough cake with yummy pecan, brown sugar filling. A small baby doll is hidden in the cake. The person who eats the piece of cake containing the baby doll gets to make the cake the next year. Guess who found the King Cake Baby last year? It should end up looking something like this. If it’s anything close to this pretty, I promise to give you a little peek later this week. Wish me luck! This entry was posted in NaBloPoMo and tagged food. Bookmark the permalink.